The million-dollar view Theimer Brown is referring to encapsulates the core of Annapolis, Maryland, a National Treasure of the National Trust. Quaint local businesses line cobbled Main Street as it slopes gently down to “Ego Alley,” locals’ term for the marina (“ego” alludes to the expensive yachts that frequent the dock on weekends and evenings). The shops and restaurants in Annapolis’ City Dock Historic District mostly cater to tourists but include many well-worn local favorites, and they all center themselves around the interplay between water and land. As it turns out, Annapolis itself was designed to do just that. View of Main Street, lined with local shops, facing St. Anne's Episcopal Church. “Fortunately for us, our ancestors got it right,” Robert Clark, CEO of Historic Annapolis, says. Francis Nicholson, appointed governor of Maryland in 1694, designed Annapolis in monumental circles with streets radiating outward from the center (this Baroque style was en vogue in European cities at the time). Because of Nicholson’s innovative plan, buildings and streets interacted with Annapolis’ topography and proximity to the water in a way that also makes sense for its modern-day layout. 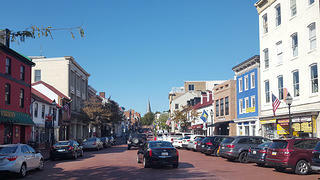 Main Street, for example, connects Ego Alley to Church Circle; St. Anne’s Episcopal Church is the focal point for that circle, on top of one of the two tallest hills in Annapolis (the State House sits at the top of the other hill). These two monuments—representing church and state—were placed higher than all other buildings in Annapolis, both physically and symbolically, to emphasize their institutional power. St. Anne’s and the State House connect directly to the dock and provide easy access to the marina, which came in use throughout Annapolis’ history as a trade center, shipbuilding port, home of the United States Naval Academy, and tourist destination. Among St. Anne’s, the State House, and stately mansions like the James Brice House and William Paca House (both of which Historic Annapolis faithfully preserved) are quaint townhouses built between the 17th and 20th centuries. These shorter, narrower buildings reflect the city’s human scale, which residents loved enough to form the local preservation organization in the 1950s to fight against demolition pressures that threatened the historic fabric of the city. 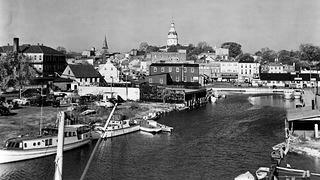 Historic image of Annapolis in the 20th century. Annapolis residents and preservation organizations sprang into action once more in 2018, when the Annapolis City Administration proposed rezoning a part of City Dock that would allow for large-scale, mixed-use development exceeding height and bulk limits established in 1978—and the National Trust took notice of their efforts. The National Trust added Annapolis’ City Dock to our 11 Most Endangered Historic Places List in June 2018, shining a national spotlight on the threat from the local government. In addition to halting the city’s plans for redevelopment in its tracks, the 11 Most listing helped Historic Annapolis secure grants that paid for the Urban Land Institute (ULI) in Baltimore to create a report proposing solutions to key issues the community feels City Dock faces. The report breaks the issues down into nine questions and answers, based on recommendations from key stakeholders, and also includes the results of a public meeting packed with 150 people—all of whom are invested in Annapolis’ future as a living, historic city. The questions and answers address financial planning, historic preservation-sensitive development, cultural heritage, and the potential reuse of the historic Burtis House, “the authentic representation of the working history of City Dock,” according to the report. The restoration of the James Brice House in Annapolis dramatically transforms the house, revealing curiosities along the way. The 2017 Keeping History Above Water conference brought attendees from around the world together to discuss the impact of sea level rise on historic coastal communities. But the concerns that rise to the top of the report are parking and flooding. The city’s original development plan (which included high-rise hotels and a glass box parking garage) was designed to address these issues, though it would have significantly compromised Annapolis’ historic fabric. Because Nicolson planned Annapolis long before the advent of automobiles, many City Dock streets are far too narrow to support the level of parking it needs today. The ULI report recommends demolishing and rebuilding an abandoned, structurally unsound parking garage to support more vehicles. The report also suggests a city-specific parking app, valet parking during peak traffic periods, and more. Flooding is a much more complex and costly threat to the city. 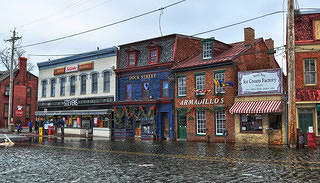 Due to climate change and rising sea levels, “nuisance-level” flooding occurs at least once a month during the full moon, when Annapolis’ water drainage system overflows and floods the streets, often making City Dock impassable. When severe weather becomes a factor, flooding is even worse. Nuisance flooding often prevents tourists from shopping at City Dock for several days at a time. The report offers many solutions to mitigate the flooding, but one of its most innovative ideas is to create a floating dock whose attached structures would include intentionally flooded first floors. Similarly, City Dock’s Susan Campbell Park would expand and become a pedestrian-only space designed to flood when water levels rise. The report also recommends increasing water access through all floating structures, as well as creating a Cultural Hazard Mitigation Plan to accommodate the many water-compatible (easy to integrate into a water setting) historic buildings at City Dock. Eileen Fogorty, consultant to Historic Annapolis, believes the city’s maritime usage and unique historic fabric will help it succeed in the face of climate change with a combination of mitigation and prevention. “I think the city can really lead the way,” she says. Around 70 stakeholders are addressing flood mitigation, resiliency, parking issues, and the other questions raised in the ULI report through Annapolis’ action committee (phase two of the response to the initial threat from the city). The first committee meeting was on March 20, 2019, and a second meeting is on the horizon. The committee—including members of the local government, preservation organizations, business owners, and residents—aims to create an actionable strategy for Mayor Buckley to implement over the next 6-12 months. After a successful first meeting, Historic Annapolis hopes the city will continue to work together to make sure City Dock continues to thrive as a special place that represents its history and its people.